Whether you are responsible for a large commercial, a condominium swimming pool, or have a small family pool in your backyard, Triangle Pool Service in Clearwater is your best choice for regular cleaning and pool maintenance. Triangle does not hire outside contractors to keep the water pristine and beautiful or maintain filtration system. For over 50 years our staff has been providing Pinellas County with quality service and customer care. If you’re responsible for a condominium pool that requires 24/7 run-time then you know how important it is to have the water looking pristine and chemically balanced at all time. This requires that your equipment runs effectively and efficiently at all times. Any municipal or commercial pool with a lot of swimmers on a daily basis needs to be carefully maintained to ensure safe swimming conditions. Specializing in real-time water management our pool maintenance and cleaning services are customized for each facility. Triangle has the equipment to remotely monitor aquatic facilities with automatic chemical dispensers that will keep your water crystal clear no matter how many swimmers and regardless of weather conditions. You might ask: What are ORP controllers? ORP stands for Oxidation-Reduction Potential. ORP controls the sanitizers in your pool or spa, monitors the activity of chlorine, bromine or ozone. It is the most accurate way to measure the pool’s disinfectant rate. This is essential to know when there are numerous swimmers on a regular basis. Even a relatively small swimming pool in your backyard requires a lot of work and attention. Why hassle yourself with the work involved in keeping the water clean and the equipment running smoothly when you could be enjoying Florida’s most popular home amenity. Imagine going home after a tough, stressful day at work with thoughts of taking a refreshing and relaxing swim but realize, just as you are about to dive in, the water has a film because you forgot or neglected to clean the pool. You made the investment in a pool for the pleasure, so make the most of it; and to do that you should hire Triangle, Clearwater’s most trusted and qualified pool maintenance service. Leave your pool cleaning and maintenance to the trained technicians at Triangle. We have a pool maintenance package that will keep you from ever having to worry about the cleanliness of the water. 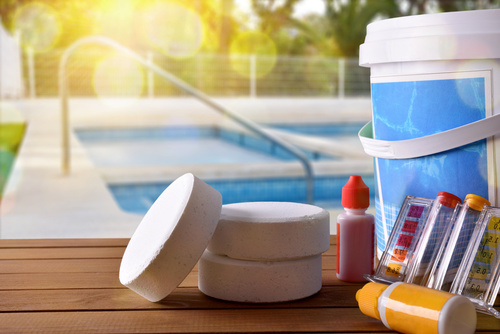 An unmaintained pool can cause serious health hazards and damage to your pool. Even something as simple as improper pH levels can cause skin irritations and damage the fiberglass lining of the walls making your pool more vulnerable to leaks. Even though you may not have to run your residential pool pump more than four hours a day, if you are not proactive regarding its maintenance, it will at some point wear out. Don’t wait until your pump fails to call a pool repair service because you don’t know what kind of collateral damage might have happened because of the pump’s failure. With a Triangle maintenance package our technicians will know beforehand if your pump is in danger of quitting.